If pictures tell a thousand words, then video tells a million! Our new video brochures offer you a fantastic way to demo your product or service to clients. Maserati saw the value in this to promote the awe inspiring Granturismo. The visuals in the video are absolutely stunning, and you can actually feel the roar of the engine as soon as you open the brochure from the powerful little speaker. Video packs give you a new and engaging way to get your message to your audience. What would previously take your contact pages and pages of text to read, can be presented in an easy format, allowing the user to sit back, relax and take in your information. They make ideal solutions for training manuals, human resources introductions packs, demonstration packages, packaging boxes, and so much more. As you can see in the demonstration below, we can insert multiple videos, volume controls, play & pause functions and other capabilities. They can be incorporated into all kinds of designs and layouts. The only limitation truly being your imagination. 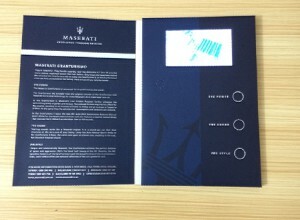 Our experience with brochure printing has allowed us to provide some spectacular promotional material over the years. And by teaming up with some of the best providers in the world for the bespoke production of the video units, we can now offer this new and engaging way to connect with your audience. We can work with your existing video material, or are partnered with a fantastic video production company that we work in partnership with to bring your ideas into reality. A great looking print product!